Kerala DHSE 2015 plus two school wise results can be known through school codes. 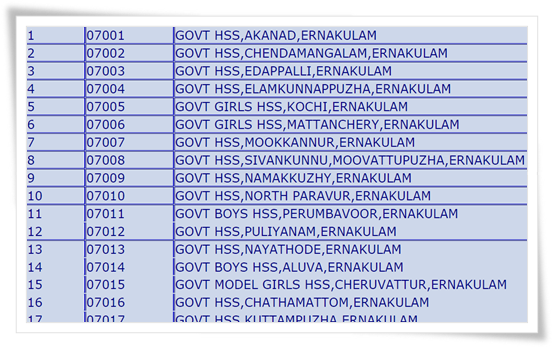 The Kerala HSE 2015 school codes of Alappuzha, Ernakulam, Idukki, Kannur, Kasaragod, Kollam, Kottayam, Kozhikode, Malappuram, Palakkad, Pathanamthitta, Thiruvanathapuram, Thrissur and Wayanad along with along with Arabian Gulf, Lakshadweep, Mahe will help to check the results online. The Kerala Plus Two results for the year 2015 will be published tomorrow (21st May 2015). Education Minister P K Abdu Rabb will declare the Kerala Higher Secondary School Examination results at a press meet at 12 PM. After the official declaration, the students who had appeared for the exam can check the results at the official websites run by the state government. Websites like www.kerala.gov.in, www.dhsekerala.gov.in, www.results.nic.in, www.keralaresults.nic.in, www.results.itschool.gov.in, www.prd.kerala.gov.in, www.cdit.org and www.examresults.kerala.gov.in are duly prepared to publish the results online. Along with the Kerala plus two results, the VHSE exam results will also be published. As marks of subjects like Physics, Chemistry and Mathematics are taken into consideration for engineering admission, double valuation has been done by the teachers. As per the procedure, the results of the Kerala Plus Two exam will be published in the official websites. To avail the results, students should provide the register number and date of birth in the prearranged website(s). Other than knowing the individual result, school wise results can also be known by providing the particular school code in the prescribed space. As soon as the code is entered, one can get the complete details and marks scored by each student who had appeared for the exam. The complete score sheet along with the grace marks will be available. Students are advices to download the HSE Plus two result 2015 score sheet from the official websites soon after the declaration of the results. Kerala DHSE Plus Two 2015 results will be published at the official websites run by the state government. The results can be known from the websites like www.kerala.gov.in, www.dhsekerala.gov.in, www.results.nic.in, www.keralaresults.nic.in, www.results.itschool.gov.in, www.prd.kerala.gov.in, www.cdit.org and www.examresults.kerala.gov.in. Education Minister P K Abdu Rabb will declare the Kerala Higher Secondary School Examination results on 21st May 2015 at a press meet at 12 PM.